Q: I've paid, how do I get to, and start, my class? Q: I use Google Chrome, will it work for this class? Q: How long do I have to start and finish the class? Q: How long do I have before my account locks, before I have to take the exam? Q: What if I don't have email? Q: I only have 3 days to get this done, can I finish it that quickly? Q: Does this program meet my courts requirement to complete a theft class? Q: What if I have not ever stolen but I have been told I have to take this class. Q: I can't complete my class by the deadline I was given. What do I do? Q: I have a yellow triangle preventing me from starting my chapter. Q: My class starts to open but isn't opening, the message just says "Wait! Do not close window" What am I suppose to do? Q: Do I have to do the entire class at one time, or can I spread it out over several sessiona and several days? Q:I've paid, how do I get to, and start, my class? Q: How does the court (person who referred me) know I completed the class? A: You are automatically authorized to generate a certificate as soon as you complete the full course. At registration, if you enter the email address of the person who referred you, that person will automatically be "informall" notified of your registration and completion status. We recommend you provide a printed Certificate of Completion to the agency/person who referred you. 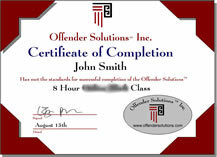 If you want Offender Solutions® to notify the referring person (or your attorney) of your completion status then AFTER completing your class, contact us (support@offendersolutions.com) and provide the 1) name, 2) agency, 3) address or FAX or e-mail address you want it sent to. A: Upon successful completion of the course, a completion certificate is unlocked/activated and immediately available to you. Also, and upon request we can mail, fax or email a Completion Certificate to the Court. A: We certainly have had people complete the class using Google Chrome but we have had more problems with Chrome than any other browser. Internet Explorer works best, FireFox "usually" works okay. A: Usually the person who refers you to Offender Solutions® decides your timeline. We don't impose a timeline on you. We will, however, close your case if there is a substantial period of inactivity - typically 1 year. Q:How long do I have before my account locks, before I have to take the exam? A: Your account is active for 1 year. We do not set timelines for you. A 4 hour class means it takes 4 hours on average to complete the class, an 8 hour class takes on average 8 hours to complete it. We do not have a clock start and limit you to 4 or 8 hours to complete your class. A: The course is available in two formats: The CORRESPONDENCE COURSE is done through the mail, no email or internet connection is required. You will be mailed a workbook and you will then reply to the questions at the end of each chapter through postal mail. Just go to "Sign Up" and you will be directed to the correspondence course. You can still take the class if you do not have an email address. For security and privacy reasons we need a way to verify the person we are communicating with (email is convenient) but the last four digits of you Social Security Number work as a substitute if you need to call..
A: Yes, however you will still be required to complete all the readings and answer each set of questions at the end of each chapter followed by a final exam. It is more up to you and your willingness to commit. You must still meet our standards when it comes to acceptable exam answers. Experience has shown that if you try to "skim" to speed things up, you will slow things down. Q:. Does this program meet my courts requirement to complete a theft class? A: Likely yes. To date only three courts have declined the use of our online theft program and two courts have declined our anger program. However you do need to double check with the person who referred you in order to be sure. You can feel even better about choosing Offender Solutions® because we offer a money back guarantee - you can read it here. A: Regardless of your situation, all of the information within this course should apply directly to your situation or life in general. A: We would encourage you to: 1. Do everything in your power to attempt to complete on time. 2. Contact your referring person (PO, Judge, Attorney, Etc.) and ask for an extension. In any case, communicating with everyone involved - sooner than later - is very important. Q: My class is stuck, it starts to open (or close) but isn't opening, the message just says "Wait! Do not close window" What am I suppose to do? A: If you haven't tuned your computer up recently you could get "stuck" opening a chapter or closing a chapter. The problem is typically easily resolved by cleaning out your "cookies" and or "Temporary Internet Files". Select " Tools " on your toolbar. Then, in the dropdown select " Internet Options " at the bottom of the pop up window. Under the "General" Tab, click the word " Delete located in the middle of the window. A new window should have popped up. Put a checkbox by "Temporary Internet Files", "Cookies" and "History". Unless you know what you are doing I suggest you uncheck the other options. At the bottom of this window click " Delete " and wait for the files to be deleted. Close Internet Explorer and re-open it. A: The quick answer is that yes, you can stop and start as many times as you want. The longer answer is that to enhance the learning experience we strongly encourage many stops. Research suggests 15 to 20 minute sessions are best. Having days between sessions is not good. Two, three or four sessions every day until done is best. Take a theft class from Offender Solutions. Get started on a better life - now!